Not to be confused with Mac Pro. The MacBook Pro (sometimes abbreviated as MBP) is a line of Macintosh portable computers introduced in January 2006 by Apple Inc. It is the high-end model of the MacBook family and is currently available in 13- and 15-inch screen sizes. A 17-inch version was available between April 2006 and June 2012. The first generation MacBook Pro is externally similar to the PowerBook G4 it replaces, but uses Intel Core processors instead of PowerPC G4 chips. The 15-inch model was introduced first, in January 2006; the 17-inch model followed in April. Both received several updates and Core 2 Duo processors later in 2006. The product's second iteration, known as the "unibody" model, has a casing made from a single piece of aluminum. It debuted in October 2008 in 13- and 15-inch screen sizes. In January 2009, the 17-inch model was updated with the same unibody design. Subsequent updates brought upgraded Intel Core i5 and i7 processors and introduced Intel's Thunderbolt technology. Apple released the third generation of MacBook Pro with a 15-inch screen during WWDC 2012 and discontinued the 17-inch variant. The previous generation 13- and 15-inch unibody models continued to sell with updated processors. The third generation model is thinner than its predecessor and is the first to include a high-resolution Retina Display. A 13-inch variant was released in October 2012. The fourth generation MacBook Pro was announced on October 27, 2016. This generation replaced all data ports with USB-C, and with the exception of the baseline model, replaced the function keys with an interactive touchscreen strip called the "Touch Bar" with a Touch ID sensor integrated into the Power button. The original 15-inch MacBook Pro was announced on January 10, 2006 by Steve Jobs at the Macworld Conference & Expo. The 17-inch model was unveiled on April 24, 2006. The first design was largely a carryover from the PowerBook G4, but uses Intel Core CPUs instead of PowerPC G4 chips. The 15-inch MacBook Pro weighs the same as the 15-inch aluminum PowerBook G4, but is 0.1 inches (0.25 cm) deeper, 0.4 inches (1.0 cm) wider, and 0.1 inches (0.25 cm) thinner. Other changes from the PowerBook include a built-in iSight webcam and the inclusion of MagSafe, a magnetic power connector designed to detach easily when yanked. These features were later brought over to the MacBook. The optical drive was reduced in size in order to fit into the slimmer MacBook Pro, hence it runs slower than the optical drive in the PowerBook G4 and cannot write to dual layer DVDs. Both the original 15- and 17-inch model MacBook Pros come with ExpressCard/34 slots, which replace the PC Card slots found in the PowerBook G4. All first generation 15-inch models have two USB 2.0 ports and one FireWire 400 port, while the 17-inch models have three USB 2.0 ports as well as one FireWire 400 port. When first introduced, the MacBook Pro did not come with FireWire 800 or S-Video ports, although FireWire 800 was added in the next 15-inch model revision and is present in every version of the 17-inch design. S-Video capability can be attained through the use of a DVI to S-Video adapter. External displays with up to a 2,560 × 1,600 pixel resolution are supported through a dual-link DVI port. All models include a built-in Gigabit Ethernet port, Bluetooth 2.0, and 802.11a/b/g. Later models include support for the draft 2.0 specification of 802.11n and Bluetooth 2.1. Apple refreshed the entire MacBook Pro line on October 24, 2006 to include Intel Core 2 Duo processors. Memory capacity was doubled for each model, to 1 GB on the low-end 15-inch and 2 GB for the high-end 15- and 17-inch models. FireWire 800 was added to the 15-inch models. Hard drive capacity was increased, although video card options stayed the same. The MacBook Pro line received a second update on June 5, 2007 with new Nvidia Geforce 8600M GT video cards and faster processor options. LED backlighting was added to the 15-inch model's screen, and its weight was reduced from 5.6 pounds (2.5 kg) to 5.4 pounds (2.4 kg). Furthermore, the speed of the front-side bus was increased from 667 MHz to 800 MHz. On November 1, 2007, Apple added the option of a 2.6 GHz Santa Rosa platform Core 2 Duo CPU as well as reconfigured hard drive options. On February 26, 2008, the MacBook Pro line was again updated. LED backlighting was added as an option for the 17-inch model. Processors were updated to "Penryn" cores, which are built on the 45 nanometer process (65 nanometer "Merom" cores were previously used), and hard drive and memory capacities were increased. Multi-touch capabilities, first introduced with the MacBook Air earlier that year, were brought over to the MacBook Pro's trackpad. 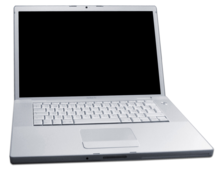 When the 15-inch unibody MacBook Pro was introduced on October 14, 2008, the pre-unibody model with the same screen size was discontinued, while the 17-inch pre-unibody model continued to be sold. The original case design was discontinued on January 6, 2009, when the 17-inch MacBook Pro was also updated with unibody construction. Some reviewers applauded the MacBook Pro for its doubling or tripling the speed of the PowerBook G4 in some areas. For example, the 3D rendering program Cinema 4D XL was 3.3 times as fast (2.3 times faster), and its boot-up time was more than twice as quick. The MacBook Pro generally outperformed the PowerBook G4 in performance analyzer utility tests XBench and Cinebench. Reviewers lauded the screen's maximum brightness, 67 percent higher than the PowerBook G4; the excellent horizontal viewing angles; the matte options; and the bright, crisp, and true colors. Although the screen offered fewer vertical pixels (1,440 × 900 in the MacBook Pro instead of 1,440 × 960 in the PowerBook), one reviewer called the screen "nothing less than stellar". Reviewers praised the new MagSafe power adapter, although one reviewer said it disconnected too easily in some instances. They also praised the backlit keyboard, large trackpad, and the virtually silent operation of the machine. The new laptop also offered better wireless performance. One reviewer criticized the decision to underclock the ATI Mobility Radeon X1600 graphics card by about 30 percent its original speed. The notebook was also noted for running hot. Users complained that upgrading system memory was harder than in older Apple notebooks. Since the dimensions for the 15-inch MacBook Pro were tweaked slightly from the 15-inch PowerBook G4, older accessories such as notebook sleeves did not work with the new models. Some users noted a slight flickering when the screen was on lower brightness settings. Apple increased the battery capacity by 10 Wh, going from 50 in the PowerBook G4 to 60, but the more powerful Core Duo CPU required more power. Battery life therefore remained about the same as in previous models, at three-plus hours. Optional 320 GB, 7,200-rpm or 128 GB SSD. On October 14, 2008, in a press event at company headquarters, Apple officials announced a new 15-inch MacBook Pro featuring a "precision aluminum unibody enclosure" and tapered sides similar to those of the MacBook Air. Designers shifted the MacBook Pro's ports to the left side of the case, and moved the optical disc drive slot from the front to the right side, similar to the MacBook. The new MacBook Pros had two video cards, which the user could switch between: the Nvidia GeForce 9600M GT with either 256 or 512 MB of dedicated memory and a GeForce 9400M with 256 MB of shared system memory. Although the FireWire 400 port was removed, the FireWire 800 port was retained. The DVI port was replaced with a Mini DisplayPort receptacle. The original unibody MacBook Pro came with a user-removable battery; Apple claimed five hours of use, with one reviewer reporting results closer to four on a continuous video battery stress test. Apple said that the battery would hold 80 percent of its charge after 300 recharges. The unibody-construction MacBook Pro largely follows the styling of the original aluminum iMac and the MacBook Air and is slightly thinner than its predecessor, albeit wider and deeper due to the widescreen display. The screen is high-gloss, covered by an edge-to-edge reflective glass finish, while an anti-glare matte option is available in the 15- and 17-inch models in which the glass panel is removed. The entire trackpad is usable and acts as a clickable button. The trackpad is also larger than the first generation model's, giving more room for scrolling and multi-touch gestures. When the line was updated in April 2010, inertial scrolling was added, making the scrolling experience much like that of the iPhone and iPad. The keys, still backlit, are now that of Apple's now-standard sunken keyboard with separated black keys. During the MacWorld Expo keynote on January 6, 2009, Phil Schiller announced a 17-inch MacBook Pro with unibody construction. This version diverged from its 15-inch sibling with an anti-glare "matte" screen option (with the glossy finish standard) and a non user-removable lithium polymer battery. Instead of traditional round cells inside the casing, the lithium-ion polymer batteries are shaped and fitted into each laptop to maximally utilize space. Adaptive charging, which uses a chip to optimize the charge flow to reduce wear and tear, extends the battery's overall life. Battery life for the 17" version is quoted at eight hours, with 80 percent of this charge remaining after 1,000 charge-discharge cycles. At Apple's Worldwide Developers Conference (WWDC) on June 8, 2009, it was announced that the 13-inch unibody MacBook would be upgraded and re-branded as a MacBook Pro, leaving only the white polycarbonate MacBook in the MacBook line. It was also announced that the entire MacBook Pro line would use the non user-removable battery first introduced in the 17-inch MacBook Pro. The updated MacBook Pro 13- and the 15-inch would each have up to a claimed seven hours of battery life, while the 17-inch would keep its eight-hour capacity. Some sources even reported up to eight hours of battery life for the 13- and 15-inch MacBook Pros during casual use, while others reported around six hours. Like the 17-inch MacBook Pro, Apple claims that they will last around 1,000 charge cycles while still containing 80 percent of their capacity. Graphics card options stayed the same from the previous release, although the 13-inch and the base model 15-inch, came with only the GeForce 9400M GPU. The screens were also improved, gaining a claimed 60 percent greater color gamut. All of these mid 2009 models also included a FireWire 800 port and all except the 17-inch models would receive an SD card slot. The 17-inch model would retain its ExpressCard/34 slot. For the 13-inch MacBook Pro, the Kensington lock slot was moved to the right side of the chassis. In August 2009, Apple extended the "matte" anti-glare display option to the 15-inch MacBook Pro. On April 13, 2010, Intel Core i5 and Core i7 CPUs were introduced in the 15- and 17-inch models, while the 13-inch retained the Core 2 Duo with a speed increase. The power brick was redesigned and a high-resolution display (of 1,680 × 1,050) was announced as an option for the 15-inch models. The 13-inch gained an integrated Nvidia GeForce 320M graphics processing unit (GPU) with 256 MB of shared memory, while the 15- and 17-inch models were upgraded to the GeForce GT 330M, with either 256 or 512 MB of dedicated memory. The 15- and 17-inch models also have an integrated Intel GPU that is built into the Core i5 and i7 processors. The 15-inch model also gained 0.1 pounds (0.045 kg). Save for a third USB 2.0 slot, all the ports on the 17-inch MacBook Pro are the same in type and number as on the 15-inch version. All models come with 4 GB of system memory that is upgradeable to 8 GB. Battery life was also extended further in this update, to an estimated ten hours for the 13-inch and 8–9 hours on the 15- and 17-inch MacBook Pros. This was achieved through both greater power efficiency and adding more battery capacity. One reviewer reported about six hours of battery life through a continuous video battery stress test in the 15-inch and another, who called the battery life "unbeatable", reported nearer to eight in the 13-inch through their "highly demanding battery drain test". Thunderbolt technology, Sandy Bridge dual core Intel Core i5 and i7 (on the 13-inch model) or quad-core i7 (on the 15- and 17-inch models) processors, and a high definition FaceTime camera were added on February 24, 2011. Intel HD Graphics 3000 come integrated with the CPU, while the 15- and 17-inch models also utilize AMD Radeon HD 6490M and Radeon HD 6750M graphics cards. Later editions of these models, following the release of OS X Lion, replaced the dashboard (F4) key with a launchpad key. The chassis bottoms are also engraved differently from the 2010 models. The Thunderbolt serial bus platform can achieve speeds of up to 10 Gbit/s, which is up to twice as fast as the USB 3.0 specification, 20 times faster than the USB 2.0 specification, and up to 12 times faster than FireWire 800. Apple says that Thunderbolt can be used to drive displays or to transfer large quantities of data in a short amount of time. On June 11, 2012, Apple showcased its upgraded Mac notebooks, OS X Mountain Lion, and iOS 6 at the Worldwide Developers Conference (WWDC) in San Francisco. The new MacBook Pro models were updated with Ivy Bridge processors and USB 3.0 ports, and the default RAM on premium models was increased to 8 GB. Following this announcement, the 17-inch model was discontinued. After a media event on October 22, 2013 Apple discontinued all second generation MacBook Pros except for the entry-level 2.5 GHz 13-inch model. Apple discontinued the 13-inch 2nd generation MacBook Pro on October 27, 2016. Prior to its discontinuation it was Apple’s only product to still include an optical drive and a Firewire port, and only laptop with a hard disk drive and Ethernet port. Some reviewers praised the new laptop's performance and compact size, the quality of the screen, and sturdy unibody build, which allowed easier upgrading of internal components as compared to the original models. Some reviewers also noted that the new MacBook Pro ran more quietly and at cooler temperatures than first generation machines. Others, however, criticized the amount of heat generated by the new design. 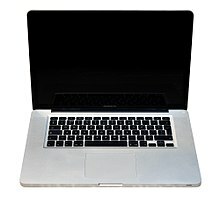 Reviewers lamented the loss of a matte screen option for the 2008 unibody MacBook Pro, noting the reflectiveness of the screen in sunlight, even when its brightness was turned all the way up. CNET's Dan Ackerman commented of the mid-2009 models: "According to Apple, the new display offers a wider color gamut, and the screen certainly looks bright and colorful, but we wish the same matte-screen option offered on the 17-inch MacBook Pro was available across the line... While the LED screen means a thinner lid and some battery life benefits, the edge-to-edge glass covering the entire display panel grabs stray light rays with ease, making the glossy screen hard to see in some lighting conditions." By 2011, matte screens were offered for both the 15" and 17" models. Furthermore, the addition of Mini DisplayPort instead of the more popular HDMI was criticized. The relatively low number of ports and lower end technical specifications when compared to similarly priced laptops from other brands were also bemoaned. Laptop Magazine's Michael Prospero praised the 2010 15-inch model's display, calling it "bright and crisp". He further commented, "While reflections from the glossy display weren't overwhelming, it's also nice to know there's an antiglare option—though only for the higher resolution display. Still, colors were bright, blacks were deep and dark, and viewing angles were excellent both vertically and horizontally." He also lauded the quality of the iSight webcam, the responsiveness of the touchpad, the microphone and speakers, as well as the performance of the new CPUs for the 15" model and the long battery life. Complaints included the price of the laptop, the low number of USB ports, and the lack of HDMI. CNET praised the automatic graphics switching features of the 15- and 17-inch 2010 models as well as the graphics cards themselves. Acclaim was also given to the Core i5 and i7 CPUs, the multi-touch trackpad, and the addition of audio capabilities to the Mini DisplayPort video output. They also called for the addition of HDMI and the Blu-ray optical disc format, saying that most other computers in the MacBook Pro's price range possessed these features. CNET also criticized the option of a higher resolution screen in the 15-inch model, saying that "the higher-resolution screen should be included by default." Optional 320 GB or 500 GB at 5,400-rpm or 7,200-rpm (15" and 17" only) or 128 GB or 256 GB SSD 250 GB, 320 GB, or 500 GB serial ATA at 5,400-rpm. Optional 320 GB or 500 GB at 5,400-rpm or 7,200-rpm or 128 GB, 256 GB, or 512 GB SSD. 320 GB (13" only), 500 GB or 750 GB serial ATA at 5,400-rpm. Since the RAM and the hard drive on some generations of MacBook Pro are user serviceable parts, there are aftermarket modifications to enhance the system with up to 16GB of DDR3-1600 RAM (maximum capacity and frequency depend on the hardware in question), 7200-rpm hard drives or third party SSDs. Early and Late 2011 models with a GPU; 15" & 17"; reportedly suffer from manufacturing problems leading to overheating, graphical issues, and eventually complete GPU and logic board failure. A similar but nonidentical issue affected iMac GPUs which were later recalled by Apple. The problem was covered by many articles in Mac-focused magazines, starting late 2013 throughout 2014. In August 2014 the law firm Whitfield Bryson & Mason LLP had begun investigating the problem to determine if any legal claim exists. On October 28, 2014, the firm announced that it has filed a class-action lawsuit in a California federal court against Apple. The lawsuit will cover residents residing in both California and Florida who have purchased a 2011 MacBook Pro notebook with an AMD graphics card. The firm is also investigating similar cases across the United States. On February 20, 2015, Apple instituted the "MacBook Pro Repair Extension Program for Video Issues". This "will repair affected MacBook Pro systems, free of charge". The program covered affected MacBook Pro models until December 31, 2016 or four years from original date of sale. A MacBook Air (top) and a third generation Retina MacBook Pro (bottom). The MacBook Pro has a thinner MagSafe 2 port and two Thunderbolt ports. On June 11, 2012, at the Apple Worldwide Developers Conference in San Francisco, Apple introduced the third generation MacBook Pro, marketed as the "MacBook Pro with Retina display" to differentiate it from the predecessor model. The new model includes Intel's third generation Core i7 processors (Ivy Bridge microarchitecture), USB 3.0, and a high-resolution 15.4" IPS 2880×1800-pixel Retina Display. Other new or changed features include a second Thunderbolt port, a HDMI port, and a thinner MagSafe port, dubbed the "MagSafe 2". Apple introduced a 13-inch version on October 23, 2012 with specifications similar but slightly inferior to the 15-inch version's, such as less powerful processors. The new models omit Ethernet and FireWire 800 ports, though Apple offers Thunderbolt adapters for both interfaces. They also omit a SuperDrive, making the 15-inch model Apple's first professional notebook since the PowerBook 2400c to ship without a built-in optical drive. Instead of a hard disk drive, the new models ship with a solid state drive housed in a proprietary flash module design rather than a 2.5" notebook drive. Apple also claims improved speakers and microphones and a new system for cooling the notebook with improved fans. The new case design does not have a Kensington lock slot, so alternative products are required to physically secure the computer. The Retina models also have fewer user-accessible upgrade or replacement options than previous MacBooks. Unlike in previous generations, the memory is soldered onto the logic board and is therefore not upgradable. The solid state drive is not soldered and can be replaced by users, although it has a proprietary connector and form factor. The battery is glued into place; attempts to remove it may destroy the battery and/or trackpad. The entire case uses proprietary pentalobe screws and cannot be disassembled with standard tools. While the battery is glued in, recycling companies have stated that the design is only "mildly inconvenient" and does not hamper the recycling process.. In any case, Apple offer a free recycling service via any of their stores and have no issue with separating the materials. On February 13, 2013, Apple announced updated prices and processors and increased the memory of the high-end 15-inch model to 16 GB. On October 22, 2013, Apple updated the line with Intel's Haswell processors and Iris Graphics, 802.11ac Wi-Fi, Thunderbolt 2, and PCIe-based flash storage. The chassis of the 13-inch version was slightly slimmed to 0.71 inches (18 mm) to match the 15-inch model. The lower-end 15-inch model only included integrated graphics while the higher-end model continued to include a discrete Nvidia graphics card in addition to integrated graphics. Support for 4K video output via HDMI was added but limited the maximum number of external displays from three to two. On July 29, 2014 Apple announced updated prices and processors for the Haswell MacBook Pro with Retina Display. On March 9, 2015, the 13-inch model was updated with Intel Broadwell processors, Iris 6100 graphics, faster flash storage, increased battery life, and a Force Touch trackpad. On May 19, 2015, the 15-inch model was also updated with similarly fast flash storage, increased battery life, the Force Touch trackpad, and an AMD Radeon R9 discrete graphics card on the higher-end model. The higher-end 15-inch model also added support for dual-cable output to 5120×2880 displays. The 15-inch models were released with the same Intel Haswell processors and Iris Pro graphics as the 2014 models due to a delay in shipment of newer Broadwell quad-core processors. Apple continued to sell the 2015 15-inch model until July 2018. The Retina Display MacBook Pro largely follows the design of the previous generation with its aluminum enclosure and separated black keys. The most apparent body changes are a thinner chassis and a display with a redesigned hinge and thinner bezel and the removal of the internal optical drive. The power button is moved from the upper right corner of the chassis onto the keyboard, taking the place of the optical disc eject button. At 0.71 inches (18 mm) thick, the 15-inch model is 25 percent thinner than its predecessor. The model name is no longer placed at the bottom of the screen bezel; instead, it is found on the underside of the chassis, similar to an iOS device. It is the first Macintosh laptop to not have its model name visible during normal use, as every prior laptop had its model name on the screen bezel or keyboard. The third generation MacBook Pro received positive reviews of the Retina Display, flash storage and power. It was criticized, however, for its high price and lack of an Ethernet port and optical drive. Roman Loyola of Macworld said that the Retina MacBook Pro was "groundbreaking" and made people "rethink how they use technology". He praised the inclusion of USB 3.0 and the slimmer body. Dan Ackerman of CNET commented "I've previously called the 15-inch MacBook Pro one of the most universally useful all-around laptops you can buy. This new version adds to that with HDMI, faster ports, and more portability. But it also subtracts from that with its exclusion of an optical drive and Ethernet port, plus its very high starting price. The Pro and Retina Pro are clearly two laptops designed for two different users, and with the exception of all-day commuters who need something closer to a MacBook Air or ultrabook, one of the two branches of the MacBook Pro family tree is still probably the most universally useful laptop you can buy." The Retina MacBook line has no internal optical drives. External drives such as Apple's SuperDrive (pictured) must be used instead. Joel Santo Domingo of PC Magazine gave the MacBook Pro an "Editor's Choice" rating. He praised its "brilliant Retina display", the thin design, port selection and speedy storage, and highlighted the expandability via Thunderbolt ports which support up to seven devices each. David Pogue of The New York Times praised the 15-inch model's screen, keyboard, sound, start-up time, cosmetics, battery life, storage, and RAM capacity. They criticized the lack of a SuperDrive, pricing, and the MagSafe 2 power connector's lack of backwards compatibility with the older MagSafe design. The Retina Display on the MacBook Pro have been criticized for "image retention", specifically for displays manufactured by LG. In 2017, one year after the introduction of the fourth generation of the MacBook Pro, the original lead developer of Tumblr Marco Arment wrote an evocative article in which he declared the third-generation MacBook Pro the best laptop ever made. The sentiment was shared by many users of various social platforms. Since the battery is glued in and cannot be easily disassembled for recycling (an EPEAT requirement), Apple received criticisms about the machine's ability to be recycled. Greenpeace spokesman Casey Harrell said Apple "has pitted design against the environment—and chosen design. They're making a big bet that people don't care, but recycling is a big issue." Wired also criticized Apple's recyclability claims, stating "[t]he design may well be comprised of 'highly recyclable aluminum and glass'—but my friends in the electronics recycling industry tell me they have no way of recycling aluminum that has glass glued to it like Apple did with both this machine and the recent iPad." Apple offers a free recycling service via any of their stores and says it has no issue with separating the materials. Apple unveiled fourth generation 13- and 15-inch MacBook Pro models during a press event at their headquarters on October 27, 2016. All models, except the baseline 13-inch model, introduced the Touch Bar, a multi-touch enabled OLED strip built into the top of the keyboard in place of the function keys. The Touch Bar models also include a sapphire-glass covered Touch ID sensor at the right end of the Touch Bar which doubles as a power button. The models also introduce a "second-generation" butterfly mechanism keyboard that provided more travel than the first iteration implemented on the Retina MacBook. The 13-inch model has a trackpad that is 46% larger than its predecessor while the 15-inch model has a trackpad twice as large as the prior generation. All ports have been replaced with either two or four combination Thunderbolt 3 ports that support USB-C 3.1 Gen 2 and dual DisplayPort 1.2 signals, any of which can be used for charging. The MacBook Pro is incompatible with some older Thunderbolt 3 certified peripherals, including Intel's own reference design for Thunderbolt 3 devices. Furthermore, macOS on MacBook Pro blocks certain classes of Thunderbolt 3 compatible devices from working by blacklisting them. Support for Thunderbolt 3 external graphics processing units (eGPU) was added in macOS High Sierra 10.13.4. Devices using HDMI, previous generation Thunderbolt, and USB will require an adapter to connect to the MacBook Pro. The models come with a 3.5 mm headphone jack, although TOSLINK functionality of older generation MacBook Pros has been removed. Other updates to the MacBook Pro include dual and quad-core Intel "Skylake" Core i5 and i7 processors, improved graphics, and displays that offer a 25% wider color gamut, 67% more brightness, and 67% more contrast. All versions are able to output to a 5K display, with the 15-inch models capable of two. The 15-inch models include a discrete Radeon Pro 450, 455 or 460 graphics card in addition to the integrated Intel graphics. Additionally, Apple introduced a cheaper lower-end 13-inch model which lacks the Touch Bar in favor of function keys, and has only two USB-C ports. The flash storage in the Touch Bar models is soldered to the logic board and is not upgradeable, while in the 13-inch model without Touch Bar, it is removable, but difficult to replace, as it is a proprietary format of SSD storage. On June 5, 2017, Apple updated the line with Intel Kaby Lake processors and newer graphics cards. Additionally, the 13-inch model now comes with a 128GB storage option, down from the base 256GB storage. New symbols are introduced to the control and option keys. On July 12, 2018, Apple updated the Touch Bar models with Intel Coffee Lake quad-core processors in 13-inch models and six-core processors in 15-inch models, updated graphics cards, improved third-generation butterfly keyboards, Bluetooth 5, T2 SoC Chip, True Tone display technology, and larger capacity batteries. The 15-inch model can also be configured with up to 4TB of storage, 32GB of DDR4 memory and a Core i9 processor. In late November the higher-end 15-inch model could be configured with Radeon Pro Vega graphics. The fourth generation MacBook Pro follows the design of the previous two generations with an all-metal unibody enclosure and separated black keys. A few apparent design changes are a thinner chassis, thinner screen bezel, larger trackpad, the OLED Touch Bar, and shallower butterfly mechanism keyboard with less key separation than the previous models. The speakers grilles have been relocated to the sides of the keyboard on the 13-inch variant. Tear downs show that the speaker grilles on the 13-inch model with Touch Bar are "largely cosmetic", and that sound output mostly comes through the side vents. The fourth generation MacBook Pro comes in two finishes, the traditional silver color and a darker "space gray" color. The MacBook Pro model name returns to the bottom of the screen bezel in Apple's San Francisco font after being absent from the third generation. As with the Retina MacBook, the new models replace the backlit white Apple logo on the rear of the screen with a glossy black opaque version. MagSafe, a magnetic charging connector, has been replaced with USB-C charging. Unlike MagSafe, which provided an indicator light within the user’s field of view to indicate the device's charging status, the USB-C charger has no visual indicator. Instead, the MacBook Pro emits a chime when connected to power. The Macintosh startup chime that has been used since the first Macintosh in 1984 is now disabled by default. The laptop now boots automatically when the lid is opened. The battery life of the new models also received mixed reception, with outlets reporting inconsistent battery life and inaccurate estimates of time remaining on battery by the operating system. Apple addressed the latter by hiding the display of estimated battery time remaining entirely in a macOS update. Consumer Reports did not initially recommend the 2016 MacBook Pro models, citing inconsistent and unpredictable battery life in its lab testing (which involves the consecutive loading of multiple websites). However, Apple and Consumer Reports found that the results had been affected by a bug caused by disabling caching in Safari's developer tools. Consumer Reports performed the tests again with a patched macOS, and retracted its original assessment. iFixit gave the models a score of 1 out of 10 for repairability, noting that memory, the processor, and flash storage are soldered to the logic board, while the battery is glued to the case. The entire assembly uses proprietary pentalobe screws and cannot be disassembled with standard tools. A report by AppleInsider has claimed that the updated butterfly keyboard fails twice as often as previous models, often due to particles stuck beneath the keys. Repairs for stuck keys have been estimated to cost more than $700. In May 2018, two class action lawsuits were filed against Apple regarding the keyboard issue with one alleging a "constant threat of nonresponsive keys and accompanying keyboard failure" and accusing Apple of not alerting consumers to the issue. In June 2018, Apple announced a Service Program to "service eligible MacBook and MacBook Pro keyboards, free of charge". The 2018 models added a membrane underneath keys to prevent malfunction from dust. As of January 2019, there are reports of issues with the same type of keyboards in the 2018 MacBook Air. Thermal throttling drew widespread attention when YouTuber Dave Lee posted a video of a MacBook Pro running Adobe Premiere that was throttled below the CPU's 2.9GHz base clock speed. PC Magazine said "the Core i9 processor Apple chose to use inside the MacBook Pro (i9-8950K) has a base clock frequency of 2.9GHz, which is capable of bursting up to 4.8GHz when necessary. However, testing carried out by YouTuber Dave Lee showed that the Core i9 couldn't even maintain 2.9GHz, let alone 4.8GHz. And it ended up running at 2.2GHz due to the heat generated inside the chassis forcing it to throttle. Lee found the 2018 i9 MacBook Pro was slower than the 2017 MacBook Pro and stated, "This isn't a problem with Intel's Core i9, it's Apple's thermal solution." When Lee put the i9 MacBook Pro inside a freezer, the render times were over 8 minutes shorter. On July 24, Apple released a software fix for the new 2018 MacBook Pros which addressed the thermal throttling issue. Apple said "there is a missing digital key in the firmware that impacts the thermal management system and could drive clock speeds down under heavy thermal loads on the new MacBook Pro". A "limited number" of 13-inch MacBook Pro units without Touch Bar, manufactured between October 2016 and October 2017, may have the built-in battery expanded, which is also known as "swelling". Apple initiated a free replacement program for eligible units. Some users are reporting kernel panics on 2018 models, possibly because of the T2 chip. Apple is already aware of the issue and performing an investigation. There are also user reports about the speaker crackling issues on the 2018 models. Users have reported malfunctioning display cables, causing uneven lighting at the bottom of the screen and ultimately display failure. The problem has been tracked to a cable, stressed from opening and closing the laptop. The entire display needs to be replaced in affected units. Apple has never acknowledged the design issue, but the cable on the 2018 models and onwards was made 2mm longer than on prior models. The fourth generation MacBook Pro received mixed reviews. The display, build quality, and audio quality were praised but many complaints went toward the keyboard butterfly switch, the touch bar not being useful in many applications due to a lack of development for it, and the lack of any USB-A ports, HDMI port or an SD card slot. Ars Technica noted that the second-generation keyboard with firm keys was a "drastic departure" from previous Retina MacBook keyboards. It further noted that resting palms may brush the trackpad occasionally causing inadvertent cursor jumps onscreen as the laptop interprets this as input, without one's hands or wrists actually resting on it. Also noted was an increase of bandwidth and approximately 40 percent increased read speed of the flash storage. Engadget praised the thinner, lighter design, improved display and audio, and increased speed of the graphics and flash storage, but criticized the lack of ports and price. Wired praised the display, calling it "the best laptop display I've ever seen", as well as praising the Touch Bar, though it criticized the need of adapters for many common connectors. Likewise, The Verge concluded that "using [the new MacBook] is alienating to anyone living in the present. I agree with Apple's vision of the future. I'm just not buying it today." Engadget voiced their concerns that "by doing things like removing full-sized USB ports, the memory card reader and even the Function row, Apple seems to have forgotten how many of us actually work". Heavy keyboard users criticized the Touch Bar, noting that command-line tools like Vim rely on keyboard usage, and the Touch Bar does not provide the tactile feedback necessary for "blind" usage of Function keys. Miriam Nielsen from the Verge said about the Touch Bar experience: "When I tried to intentionally use the Touch Bar, I felt like a kid learning how to type again. I had to keep looking down at the bar instead of looking at the images I was actually trying to edit." She also pointed out that after learning the Touch Bar one cannot work as efficiently on any other computer. Developers have their share of headaches because they cannot rely on the Touch Bar being present on every machine that runs their software. Even if Apple makes the Touch Bar an integral part of macOS, it will take "many years" for it to become ubiquitous, in the meantime anything in the Bar needs to be available through another part of the interface. Other items of critique were non-compatibility between Thunderbolt 2 and 3 devices, frequently unpleasant fan whine noises in idle CPU states on the larger screen (15") models were reported, where the two integrated fans run all the time by default. The coprocessor powering the touch bar and higher TDP of the stronger CPU models are responsible for this behavior. YouTube tech reviewer Dave Lee was very critical of the high price of the MacBook Pro. He ultimately said that "for most people, [the MacBook Pro] is just way too expensive and overpriced." The macOS operating system has been pre-installed on all MacBook Pros since release, starting with version 10.4.4 (Tiger). Along with OS X, iLife has also shipped with all systems, beginning with iLife '06. The MacBook Pro comes with the successor to BIOS, Extensible Firmware Interface (EFI) 1.1. EFI handles booting differently from BIOS-based computers, but provides backwards compatibility, allowing dual and triple boot configurations. In addition to OS X, the Microsoft Windows operating system is installable on Intel x86-based Apple computers. Officially, this is limited to both 32-bit and 64-bit versions of Windows XP, Vista, 7, 8, and 10 with the necessary hardware drivers included with the Boot Camp software. Other x86 operating systems such as Linux are also unofficially supported. This is made possible by the presence of the Intel architecture as provided by the CPU and the BIOS emulation Apple has provided on top of EFI. ^ Through use of a second display, all pre-unibody MacBook Pros simultaneously support their native resolution on the internal display and a maximum of 2560 × 1600 on an external display. ^ a b c d e Existing memory modules may need to be replaced. ^ a b Some sources reference 6 GB functionality. ^ a b c d Hard and solid-state drives listed are configurations available from Apple. ^ a b Quoted optical drive speeds are the maximum possible for each drive. ^ Wireless-N functionality requires installing the wireless-N enabler software included with the AirPort Extreme Wireless-N Router or sold as a download on the Apple online store, or by upgrading to OS X 10.5 "Leopard" or later. ^ "Apple MacBook Pro review: late-2013 model with Retina display & Nvidia graphics". Wired UK. ^ a b c d "Apple Introduces MacBook Pro". Apple. January 10, 2006. Archived from the original on January 8, 2010. Retrieved April 11, 2010. ^ a b "Apple Introduces 17-inch MacBook Pro". Apple. April 24, 2006. Archived from the original on March 28, 2010. Retrieved April 11, 2010. ^ a b c d e f g Snell, Jason (February 25, 2006). "MacBook Pro/1.83 GHz and 2.0 GHz". MacWorld. Retrieved April 18, 2010. ^ a b c d e f g h i j k l m Cheng, Jacqui (March 1, 2006). "MacBook Pro". Ars Technica. Retrieved April 22, 2010. ^ a b c d e Jackman, Tom (April 17, 2006). "Apple MacBook Pro Review (pics, specs)". NotebookReview. TechTarget. Retrieved April 19, 2010. ^ a b c d "MacBook Pro – Technical Specifications". Apple. Retrieved October 22, 2009. ^ a b c d "MacBook Pro (17-inch) – Technical Specifications". Apple. Retrieved October 22, 2009. ^ a b c d e "Apple MacBook Pro Notebooks Now with Intel Core 2 Duo Processors". Apple. October 24, 2006. Archived from the original on March 5, 2010. Retrieved April 22, 2010. ^ a b "MacBook Pro (Early 2008) – Technical Specifications". Apple. Retrieved October 22, 2009. ^ a b "MacBook Pro (Late 2006) – Technical Specifications". Apple. Retrieved October 22, 2009. ^ "Apple Updates MacBook Pro". Apple. June 5, 2007. Retrieved April 23, 2010. ^ a b c d "Apple MacBook Pro "Core 2 Duo" 2.2 15" (SR) Specs". EveryMac. Retrieved April 24, 2010. ^ a b c d e "Apple MacBook Pro "Core 2 Duo" 2.4 15" (08) Specs". EveryMac. Retrieved April 24, 2010. ^ "Apple Introduces New MacBook and MacBook Pro Models". Apple. February 26, 2008. Retrieved April 25, 2010. ^ "Compatibility Labs Equipment List: Project X" (PDF). Apple. Retrieved April 24, 2010. ^ a b "Apple MacBook Pro "Core 2 Duo" 2.66 17" (Unibody) Specs". EveryMac. Retrieved April 24, 2010. ^ "MacBook Pro (15-inch Glossy) – Technical Specifications". Apple. Retrieved October 22, 2009. ^ "MacBook Pro (Mid 2007, 2.4/2.2 GHz) – Technical Specifications". Apple. Retrieved October 22, 2009. ^ "MacBook Pro (Late 2007, 2.4/2.2 GHz) – Technical Specifications". Apple. Retrieved October 22, 2009. ^ "A note about MacBook Pro updates". Switch To A Mac. Retrieved April 26, 2010. ^ "New MacBook Family Redefines Notebook Design". Apple. October 14, 2008. Retrieved April 24, 2010. ^ Morgenstern, David; O'Grady, Jason (October 30, 2006). "Inside the MacBook Pro's 3 GB RAM limitation". ZDNet. Retrieved June 9, 2009. ^ a b Engst, Adam (October 31, 2008). "6 GB of RAM in a MacBook or MacBook Pro". TidBITS. Retrieved April 25, 2010. ^ "Apple refreshes 17-inch MacBook Pro and MacBook Air". AppleInsider. October 14, 2008. Retrieved January 10, 2010. ^ McNulty, Scott (January 30, 2007). "Airport Extreme 802.11n Enabler for Mac". The Unofficial Apple Weblog. Retrieved April 25, 2010. ^ "Click Here Apple AirPort Extreme 802.11n Enabler 1.0 for Mac". CNET. Retrieved April 25, 2010. ^ a b c d e f "Apple MacBook Pro "Core 2 Duo" 2.53 15" (Unibody) Specs". EveryMac. 2008. Retrieved April 24, 2010. ^ a b "Apple WWDC Keynote Address". Apple. Archived from the original (QuickTime Movie) on June 11, 2009. Retrieved June 10, 2009. ^ a b c d e f g h Spitalieri, Mike (November 4, 2008). "Apple MacBook Pro Review (Late 2008 Model)". NotebookReview. TechTarget. Retrieved April 24, 2010. ^ Breen, Christopher (December 10, 2008). "Monitoring your MacBook's battery". MacWorld. Retrieved April 21, 2010. ^ a b c d e Ackerman, Dan (June 10, 2009). "Apple MacBook Pro Summer 2009 (Core 2 Duo 2.26 GHz, 2GB RAM, 160GB HDD, Nvidia GeForce 9400M, 13-inch)". CNET. Retrieved April 11, 2010. ^ a b c d Rougeot, Jonathan (April 2010). "Apple MacBook Pro (13-Inch, 2010 Version)". Computer Shopper. SX2 Media Labs. Archived from the original on July 23, 2011. Retrieved April 17, 2010. ^ a b c d Prospero, Michael (April 14, 2010). "Apple MacBook Pro 15-inch (Core i7)". Laptop Magazine. Retrieved April 17, 2010. ^ a b c d e Ackerman, Dan (April 15, 2010). "Apple MacBook Pro Spring 2010 (Core i7 2.66 GHz, 4GB RAM, 500GB HDD, 15-inch)". CNET. Retrieved April 17, 2010. ^ a b c "Apple Introduces 17-inch MacBook Pro With Revolutionary New Built-in Battery That Delivers Eight Hours of Use & 1,000 Recharges". Apple. January 6, 2009. Retrieved April 11, 2010. ^ a b Ackerman, Dan (June 8, 2009). "New Apple MacBooks demystified". CNET. Retrieved April 11, 2010. ^ Johnson, Bobbie (June 8, 2008). "Apple iPhone announcements: from the show floor and all around". The Guardian. UK. Retrieved June 10, 2009. ^ a b c Ackerman, Dan (October 29, 2009). "Mac laptop family album". CNET. Retrieved April 11, 2010. ^ Shimpi, Anand Lal (June 6, 2009). "AnandTech: Apple's 2009 MacBook Pro: Battery Life to Die For". AnandTech. Retrieved June 14, 2009. ^ "Apple Updates MacBook Pro Family with New Models & Innovative Built-in Battery for Up to 40 Percent Longer Battery Life". Apple. June 8, 2009. Retrieved April 25, 2010. ^ a b "Apple MacBook Pro "Core 2 Duo" 2.53 13" (SD/FW) Specs". Everymac.com. Retrieved April 26, 2010. ^ a b "Apple MacBook Pro "Core 2 Duo" 2.53 15" (SD) Specs". Everymac.com. Retrieved April 26, 2010. ^ Galbraith, James (June 24, 2009). "Apple 13-inch MacBook Pro/2.26 GHz". PC World. International Data Group. Retrieved April 25, 2010. ^ Dalrymple, Jim (August 11, 2009). "Apple adds antiglare to 15-inch MacBook Pro". CNET. Retrieved January 6, 2012. ^ a b c d e f g h "Apple Updates MacBook Pro Line". Apple. April 13, 2010. Retrieved April 13, 2010. ^ Sevilla, Gadjo Cardenas (May 19, 2010). "New 17-inch MacBook Pro at the cutting edge of performance". WhatsYourTech.ca. Retrieved May 25, 2010. ^ "The new MacBook Pro. Huge leaps in performance". Apple Inc. Retrieved February 24, 2011. ^ "Thunderbolt Technology: The Fastest Data Connection to Your PC Just Arrived". ^ a b "Thunderbolt". Apple. February 24, 2011. Archived from the original on February 26, 2011. ^ a b "Apple set to showcase iOS 6, new Macs". The Times Of India. June 11, 2012. ^ a b "Apple announces iOS 6, MacBook with retina display at WWDC 2012". The Times Of India. June 11, 2012. Archived from the original on October 29, 2013. Retrieved July 2, 2013. ^ "Apple kills off 15-inch MacBook Pro with optical drive, but 13-inch model remains". The Verge. Vox Media. ^ Rossignol, Joe. "Apple No Longer Sells a Mac With a CD Drive". ^ "Consumers Report 2011 Apple MacBook Pro Defect". The Glynn Law Group. December 22, 2011. Archived from the original on February 15, 2013. Retrieved February 2, 2013. ^ "Is the 2011 Macbook Pro overheating?". HardMac. March 22, 2011. Archived from the original on November 26, 2011. Retrieved February 2, 2013. ^ "Vintage and obsolete products". Apple. ^ "How to identify Macbook Pro models". Apple. Retrieved July 5, 2011. ^ "MacBook Pro (15-inch, Late 2008) - Technical Specifications". Apple. Retrieved May 24, 2015. ^ "MacBook Pro (17-inch, Early 2009) - Technical Specifications". Apple. Retrieved May 24, 2015. ^ "MacBook Pro (13-inch, Mid 2009) - Technical Specifications". Apple. Retrieved May 24, 2015. ^ "MacBook Pro (15-inch, Mid 2009) - Technical Specifications". Apple. Retrieved May 24, 2015. ^ "MacBook Pro (17-inch, Mid 2009) - Technical Specifications". Apple. Retrieved May 24, 2015. ^ "MacBook Pro (13-inch, Mid 2010) - Technical Specifications". Apple. Retrieved May 24, 2015. ^ "MacBook Pro (15-inch, Mid 2010) - Technical Specifications". Apple. Retrieved May 24, 2015. ^ "MacBook Pro (17-inch, Mid 2010) - Technical Specifications". Apple. Retrieved May 24, 2015. ^ "MacBook Pro (13-inch, Early 2011) - Technical Specifications". Apple. Retrieved May 24, 2015. ^ "MacBook Pro (15-inch, Early 2011) - Technical Specifications". Apple. Retrieved May 24, 2015. ^ "MacBook Pro (17-inch, Early 2011) - Technical Specifications". Apple. Retrieved May 24, 2015. ^ "MacBook Pro (13-inch, Late 2011) - Technical Specifications". Apple. Retrieved May 24, 2015. ^ "MacBook Pro (15-inch, Late 2011) - Technical Specifications". Apple. Retrieved May 24, 2015. ^ "MacBook Pro (17-inch, Late 2011) - Technical Specifications". Apple. Retrieved May 24, 2015. ^ "MacBook Pro (13-inch, Mid 2012) - Technical Specifications". Apple. Retrieved May 24, 2015. ^ "MacBook Pro (15-inch, Mid 2012) - Technical Specifications". Apple. Retrieved May 24, 2015. ^ "MacBook Pro Core 2 Duo 2.66 15" (Unibody) Specs (Early 2009)". EveryMac. Retrieved July 31, 2014. ^ a b "Apple MacBook Pro "Core 2 Duo" 2.8 17" (Mid-2009) Specs". EveryMac. Retrieved April 25, 2010. ^ "Apple Updates MacBook Pro with Next Generation Processors, Graphics & Thunderbolt I/O Technology". Apple. February 24, 2011. Retrieved June 14, 2012. ^ "New MacBook Pro Lineup Brings Faster Processor and Bigger Hard Drives". AppleInformer. Archived from the original on November 7, 2011. Retrieved October 24, 2011. ^ a b Savov, Vlad (June 6, 2012). "MacBook Pro upgraded with Ivy Bridge CPUs, Nvidia graphics, shipping today". The Verge. Vox Media. Retrieved June 12, 2012. ^ a b Bohn, Dieter (June 11, 2012). "Apple announces next-generation 15-inch MacBook Pro with Retina display, ships today for $2,199". The Verge. Vox Media. Retrieved June 12, 2012. ^ Slivka, Eric (March 7, 2011). "'Secret' Firmware Update Unlocks Support for 8 GB RAM on 'Late 2008' Notebooks". MacRumors. Retrieved March 23, 2011. ^ "2nd Generation Intel® Core™ Processor Family Mobile with ECC, Datasheet Addendum, May 2012, Revision 002" (PDF). 1.4 Interfaces 1.4.1 System Memory Support: Intel Corporation. May 2012. p. 10. Retrieved March 25, 2015. 1.4.1 System Memory Support "DDR3 I/O Voltage of 1.5 V". ^ "1600mhz works and runs at 1600 MacBook pro 2011". Retrieved January 31, 2015. ^ "ARK | Compare Intel® Products". Intel. Retrieved May 9, 2014. ^ "About integrated video on Intel-based Macs". apple.com. ^ "iMac 2011 GPU Recall". Archived from the original on September 24, 2014. Retrieved September 18, 2014. 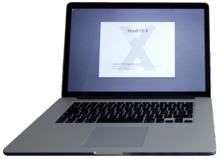 ^ "Apple - Little utility rescues a MacBook Pro with failing video". Retrieved September 19, 2014. ^ "Internet reports suggest possible 2011 MacBook Pro graphics issue". Retrieved September 19, 2014. ^ "Early 2011 MacBook Pros Are Dropping Like Flies". Retrieved September 19, 2014. ^ "Some 2011 MacBook Pros Experiencing GPU Glitches, System Crashes". Retrieved September 19, 2014. ^ "Apple remains mum as complaints mount over 2011 MacBook Pro GPU failures". Retrieved September 19, 2014. ^ "Lawyers Researching Possible Class Action Lawsuit Over 2011 MacBook Pro Graphics Issues". Retrieved September 19, 2014. ^ "Class Action Filed Against Apple for Defective 2011 MacBook Pro Laptops". Whitfield Bryson & Mason LLP. Retrieved November 19, 2014. ^ "MacBook Pro Repair Extension Program for Video Issues - Apple Support". www.apple.com. Retrieved January 8, 2018. ^ a b "Apple - MacBook Pro with Retina display". ^ a b D'Orazio, Dante (October 23, 2012). "Apple introduces new 13-inch MacBook Pro with Retina display, ships today for $1,699". The Verge. Vox Media. Retrieved February 21, 2013. ^ WWDC 2012: New Thunderbolt Gear Unveiled by Apple[permanent dead link] June 12, 2012. ^ "Apple Macintosh 2400c/180 specs". Retrieved June 12, 2012. ^ Chan, Casey. "The Only Way to Lock Your New Retina MacBook Pro Is to Make It Fatter, Uglier and Heavier With Plastic". Gizmodo.co.uk. Retrieved December 16, 2012. ^ "OWC Announces Mercury Aura Pro as Industry's First Solid State Drive Upgrade for 2012 MacBook Pro with Retina display". macsales.com. ^ "Want to upgrade that 'Retina' MacBook Pro? Tough luck". ZDNet. ^ "Recyclers disagree on impact of glued-in Retina MacBook Pro batteries". Ars Technica. Retrieved October 21, 2012. ^ a b Patel, Nilay (February 13, 2013). "Apple lowers 13-inch Macbook Pro with Retina display price to $1,499, speedbumps other Retina machines". The Verge. Vox Media. Retrieved February 21, 2013. ^ a b Seifert, Dan (October 22, 2013). "Apple refreshes MacBook Pro lineup: thinner, lighter, faster, and cheaper with better battery life". The Verge. Vox Media. Retrieved May 24, 2015. ^ Dan Ackerman (March 7, 2014). "Apple MacBook Pro (15-inch, 2013) review - CNET". CNET. CBS Interactive. ^ a b "Using 4K displays and Ultra HD TVs with Mac computers". apple.com. ^ a b Lowensohn, Josh (July 29, 2014). "Apple's MacBook Pros with Retina display now have faster processors and more memory". The Verge. Vox Media. Retrieved July 30, 2014. ^ Apple Inc. (March 9, 2015). "Apple Updates 13-inch MacBook Pro with Retina Display & MacBook Air" (Press release). San Francisco. Retrieved March 12, 2015. ^ a b Lowensohn, Josh (March 9, 2015). "Apple updates MacBook Air and Retina MacBook Pro with faster chips, Thunderbolt 2". The Verge. Vox Media. Retrieved May 24, 2015. ^ Apple Inc. (May 19, 2015). "Apple Introduces 15-inch MacBook Pro with Force Touch Trackpad & New $1,999 iMac with Retina 5K Display" (Press release). San Francisco. ^ a b McCormick, Rich; Kastrenakes, Jacob (May 19, 2015). "Apple releases cheaper Retina iMac and 15-inch MacBook Pro with Force Touch". The Verge. Vox Media. Retrieved May 24, 2015. ^ "MacBook Pro - Technical Specifications 2015". ^ RIP mid-2015 MacBook Pro, the best laptop ever made. Mashable. 12 July 2018. ^ Hands On: 15-Inch Apple MacBook Pro With Retina Display June 12, 2012. ^ Unboxing the new MacBook Pro June 12, 2012. ^ Roman Loyola (June 15, 2012). "MacBook Pro with Retina Display redefines the concept of a 'pro' laptop". Macworld. Retrieved August 26, 2012. ^ Ackerman, Dan (June 11, 2012). "Apple MacBook Pro with Retina Display review". CNET. CBS Interactive. Retrieved August 26, 2012. ^ Santo Domingo, Joel. "Apple MacBook Pro 15-inch (Retina Display) review". PC Magazine. Ziff Davis. Retrieved August 27, 2012. ^ Pogue, David (June 14, 2012). "MacBook, a Point Shy of Perfect". The New York Times. Retrieved February 18, 2013. ^ "Apple's new Retina Display dogged by image retention, increasingly unhappy users". August 24, 2012. ^ "Avoiding image persistence on Apple displays". June 14, 2013. ^ "The best laptop ever made". November 14, 2017. ^ "Hacker News: The best laptop ever made". November 14, 2017. ^ "Apple's withdrawal from 'green' certification program surprises purchasers". mercurynews.com. ^ Chang, Roger (June 14, 2012). "The New MacBook Pro: Unfixable, Unhackable, Untenable". Wired. ^ "MacBook Pro (Retina, 15-inch, Mid 2012) - Technical Specifications". Apple. Retrieved May 24, 2015. ^ "MacBook Pro (Retina, 13-inch, Late 2012) - Technical Specifications". Apple. Retrieved May 24, 2015. ^ "MacBook Pro (Retina, 13-inch, Early 2013) - Technical Specifications". Apple. Retrieved May 24, 2015. ^ "MacBook Pro (Retina, 15-inch, Early 2013) - Technical Specifications". Apple. Retrieved May 24, 2015. ^ "MacBook Pro (Retina, 13-inch, Late 2013) - Technical Specifications". Apple. Retrieved May 24, 2015. ^ "MacBook Pro (Retina, 15-inch, Late 2013) - Technical Specifications". Apple. Retrieved May 24, 2015. ^ "MacBook Pro (Retina, 13-inch, Mid 2014) - Technical Specifications". Apple. Retrieved May 24, 2015. ^ "MacBook Pro (Retina, 15-inch, Mid 2014) - Technical Specifications". Apple. Retrieved May 24, 2015. ^ "MacBook Pro (Retina, 13-inch, Early 2015) - Technical Specifications". Apple. Retrieved May 24, 2015. ^ "MacBook Pro (Retina, 15-inch, Mid 2015) - Technical Specifications". Apple. Retrieved May 24, 2015. ^ Technical specifications of ME664LL/A from Apple's knowledge base and from EveryMac.com. Retrieved 2018-02-17. ^ "Apple MacBook Pro 15" Retina 2.4GHz i7-3635QM 15.4" 2880 x 1800pixels Silver Notebook". Intel. Retrieved February 17, 2018. ^ Kyle Media LLC. "MacBook Pro "Core i7" 2.3 15" Retina 2012 Specs (Retina Mid-2012, MC975LL/A, MacBookPro10,1, A1398, 2512) @ EveryMac.com". everymac.com. ^ "New MacBook Pro's Dedicated AMD Graphics Chips Are 'Significantly' Faster and Support Dual 5K Displays". Retrieved November 1, 2017. ^ a b c d e f g "The £1,450 2016 MacBook Pro reviewed: An expensive MacBook Air on the inside". Ars Technica UK. Retrieved November 6, 2016. ^ "2016 MacBook Pros may not be compatible with currently available Thunderbolt 3 devices". Retrieved December 16, 2016. ^ "New MacBook Pro models reportedly incompatible with certain Thunderbolt 3 devices". Retrieved December 16, 2016. ^ "Apple's new dongle-happy MacBook Pros not fully compatible with Thunderbolt 3 peripherals". Retrieved December 16, 2016. ^ Use an external graphics processor with your Mac. Apple. ^ "Here's everything you need to know about USB-C and Thunderbolt 3". CNET. Retrieved November 6, 2016. ^ Apple gives the MacBook and MacBook Pros a Kaby Lake refresh. Ars Technica. 5 June 2017. ^ Apple’s new 2018 MacBook Pros are now available, and the top specs are much faster. Ars Technica. 12 July 2018. ^ "How Apple Alienated Mac Loyalists". Bloomberg. Retrieved January 13, 2017. ^ "Apple 'fixes' inaccurate MacBook Pro battery estimate – by removing it". The Guardian. Retrieved January 13, 2017. ^ "Consumer Reports now recommends Apple's new MacBook Pro after software update". The Verge. Retrieved January 13, 2017. ^ "Apple working with Consumer Reports to pin down inconsistent MacBook Pro battery test results". The Verge. Retrieved January 13, 2017. ^ Wuerthele, Mike (April 30, 2018). "2016 MacBook Pro butterfly keyboards failing twice as frequently as older models". AppleInsider. Retrieved May 31, 2018. ^ Axon, Samuel (May 8, 2018). "Report: Butterfly MacBook Pro keyboards require more frequent, more expensive repairs". Ars Technica. Retrieved May 31, 2018. ^ Moyer, Edward (May 12, 2018). "Apple MacBook keyboard issue prompts lawsuit". CNET. Retrieved May 31, 2018. ^ Heisler, Yoni (May 23, 2018). "Apple hit with another class-action lawsuit over the MacBook Pro keyboard design". Boy Genius Report. Retrieved May 31, 2018. ^ Tibken, Shara (June 22, 2018). "Apple will fix sticky keyboards on some MacBooks, MacBook Pros". CNET. Retrieved July 1, 2018. ^ iFixit tests how the anti-dust membrane in new MacBook Pro really works. The Verge. 19 July 2018. ^ New MacBook Air 2018 keyboard flaw uncovered by YouTuber, with reference to YouTuber Lewis Hilsenteger. ^ "MacBook Pro 15 (2018) - Beware the Core i9". YouTube. July 17, 2018. ^ Core i9 MacBook Pro Cooling Problems Kill Performance. PCMag. 19 July 2018. ^ Heater, Brian. "Apple apologizes, issues update for MacBook Pro thermal throttling bug". Tech Crunch. Retrieved July 25, 2018. ^ 'Flexgate' Display Issues Affecting 2016 MacBook Pro and Later. MacRumors. 1 February 2019. ^ Apple quietly addressed ‘Flexgate’ issue with MacBook Pro redesign. The Verge. 5 March 2019. ^ "Engadget - MacBook Pro review (2016): A step forward and a step back". ^ Li, Charlee. "Why Developers Should NOT Use MacBook Pro". ^ Nielsen, Miriam. "MacBook Pro with Touch Bar review: a touch of the future". ^ Spence, Ewan (April 11, 2017). "Apple Losing Out As Consumers Reject The New MacBook Pro". ^ a b "MacBook Pro (13-inch, 2016, Two Thunderbolt 3 Ports) - Technical Specifications". Apple. Retrieved October 27, 2016. ^ a b "MacBook Pro (13-inch, 2016, Four Thunderbolt 3 Ports) - Technical Specifications". Apple. Retrieved October 27, 2016. ^ a b "MacBook Pro (15-inch, 2016) - Technical Specifications". Apple. Retrieved October 27, 2016. ^ a b "MacBook Pro (13-inch, 2017, Two Thunderbolt 3 Ports) - Technical Specifications". Apple. Retrieved September 18, 2017. ^ a b "MacBook Pro (13-inch, 2017, Four Thunderbolt 3 Ports) - Technical Specifications". Apple. Retrieved September 18, 2017. ^ a b "MacBook Pro (15-inch, 2017) - Technical Specifications". Apple. Retrieved September 18, 2017. ^ a b "MacBook Pro (13-inch, 2018, Four Thunderbolt 3 Ports) - Technical Specifications". Apple. Retrieved July 12, 2018. ^ a b "MacBook Pro (15-inch, 2018) - Technical Specifications". support.apple.com. Retrieved December 9, 2018. ^ "Apple Unveils Groundbreaking New MacBook Pro". Apple. Retrieved November 16, 2016. ^ "First Apple MacBook Pro with Touch Bar orders shipped, arriving Monday". AppleInsider. Retrieved November 16, 2016. ^ "Apple updates MacBook Pro with faster performance and new features for pros". Apple. Retrieved July 12, 2018. ^ a b c "MacBook Pro - Technical Specifications". Apple (United Kingdom). Retrieved October 30, 2016. ^ "Intel® Core™ i5-6360U Processor (4M Cache, up to 3.10 GHz) Specifications". Intel® ARK (Product Specs). Retrieved October 30, 2016. ^ "Intel® Core™ i7-6660U Processor (4M Cache, up to 3.40 GHz) Specifications". Intel® ARK (Product Specs). Retrieved October 30, 2016. ^ "Intel® Core™ i5-6267U Processor (4M Cache, up to 3.30 GHz) Specifications". Intel® ARK (Product Specs). Retrieved October 30, 2016. ^ "Intel® Core™ i5-6287U Processor (4M Cache, up to 3.50 GHz) Specifications". Intel® ARK (Product Specs). Retrieved October 30, 2016. ^ "Intel® Core™ i7-6567U Processor (4M Cache, up to 3.60 GHz) Specifications". Intel® ARK (Product Specs). Retrieved October 30, 2016. ^ "Intel® Core™ i7-6700HQ Processor (6M Cache, up to 3.50 GHz) Specifications". Intel® ARK (Product Specs). Retrieved October 30, 2016. ^ "Intel® Core™ i7-6820HQ Processor (8M Cache, up to 3.60 GHz) Specifications". Intel® ARK (Product Specs). Retrieved October 30, 2016. ^ "Intel® Core™ i7-6920HQ Processor (8M Cache, up to 3.80 GHz) Specifications". Intel® ARK (Product Specs). Retrieved October 30, 2016. ^ "Intel® Core™ i7-7820HQ Processor (8M Cache, up to 3.90 GHz) Specifications". Intel® ARK (Product Specs). Retrieved June 5, 2017. ^ "Intel® Core™ i5-8259U Processor (6M Cache, up to 3.80 GHz) Specifications". Intel® ARK (Product Specs). Retrieved July 13, 2018. ^ "Intel® Core™ i7-8559U Processor (8M Cache, up to 4.50 GHz) Specifications". Intel® ARK (Product Specs). Retrieved July 13, 2018. ^ "Intel® Core™ i7-8750H Processor (9M Cache, up to 4.10 GHz) Specifications". Intel® ARK (Product Specs). Retrieved July 13, 2018. ^ "Intel® Core™ i7-8850H Processor (9M Cache, up to 4.30 GHz) Specifications". Intel® ARK (Product Specs). Retrieved July 13, 2018. ^ "Intel® Core™ i9-8950HK Processor (12M Cache, up to 4.80 GHz) Specifications". Intel® ARK (Product Specs). Retrieved July 13, 2018. ^ a b Ganesh T S (May 9, 2016). "Choosing the Right SSD for a Skylake-U System". AnandTech. Retrieved November 16, 2016. ^ "Intel® Core™ i7-6660U Processor". July 9, 2016. Retrieved November 16, 2016. ^ "Intel® Core™ i7-6567U Processor". October 9, 2015. Retrieved November 16, 2016. ^ "Intel® Core™ i7-7660U Processor Processor". March 9, 2017. Retrieved November 16, 2018. ^ "Intel® Core™ i7-7567U Processor". July 9, 2017. Retrieved November 16, 2018. ^ "Intel® Core™ i7-8559U Processor". July 9, 2018. Retrieved November 16, 2018. ^ "Video: SSD In Late 2016 'Entry-Level' MacBook Pro Removable". October 28, 2016. ^ "Unboxing of 2017 13″ MacBook Pro Base Model Shows Removable SSD". June 15, 2017. ^ "2018 13-Inch MacBook Pro With Touch Bar Has Four Full-Speed Thunderbolt 3 Ports". Retrieved July 25, 2018. ^ "MacBook Pro (13-inch, 2018, Four Thunderbolt 3 Ports) - Technical Specifications". support.apple.com. Retrieved July 25, 2018. ^ "Thunderbolt - Apple (CA)". Apple (Canada). Retrieved October 28, 2016. ^ "2018 MacBook Pros Have New 'Titan Ridge' Thunderbolt 3 Controller". Retrieved February 6, 2019. ^ "Overview". Unified EFI Forum. Retrieved February 6, 2010. ^ Morgenstern, David. "Apples Boot Camp and the Myth of Mac Software Availability". eWeek. Ziff Davis Enterprise. Retrieved April 21, 2010. ^ "Can the MacBook Pro run Linux?". EveryMac. Retrieved April 25, 2010. ^ Cherif (2007), p. 345–359. ^ Nikkel, Bruce (November 19, 2009). "Forensic Analysis of GPT Disks and GUID Partition Tables" (PDF). The International Journal of Digital Forensics and Incident Response. Elsevier. 6 (1–2): 18. doi:10.1016/j.diin.2009.07.001. Retrieved April 26, 2010. Apple's Boot Camp was developed to allow operating systems (primarily [W]indows) to load on Macintosh hardware. To achieve this, Boot Camp provides a BIOS compatibility module to allow native booting without EFI support. This has also been called "BIOS emulation", "hybrid GPT/MBR", "BIOS-based booting" or "legacy OS booting". Wikimedia Commons has media related to MacBook Pro. This page was last edited on 19 April 2019, at 22:09 (UTC).